XT1 – A wide range grind that works in a variety of conditions from approximately -10°C to -20°C. XT2 – This grind works in a variety of snow conditions from approximately -5°C to -15°C. LW3 – This grind is recommended for wet snow/klister classic skis. ZN4 – This is a spring conditions grind. LW1- This grind is well suited for skin skis in cold conditions. 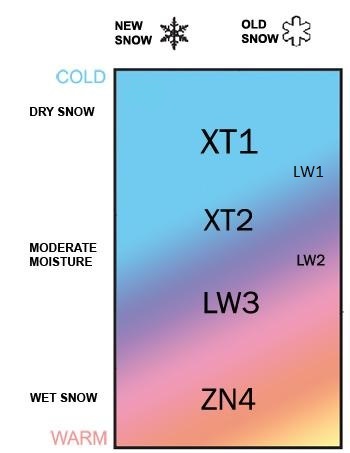 LW2 – An excellent grind for skin skis in moderate conditions.